Published in the South Kent Gazette, 11 February, 1981. Opposite this store the Primitive Methodists had their first meeting place in a loft, from which they moved to their new Peter Street chapel in 1860. Branch Street was the boundary of the Poorhouse land, and was laid out at the same time to connect Peter Street with Bridge Street, and all the houses there were of a date subsequent to the sale of St. Mary’s estate, except those nearest to Peter Street, which were probably converted out of a detached building associated with the Poorhouse. On the west side of Branch Street was the aerated waters and sweet manufactory of Mr. S. R. Elms, established in 1837, which was eventually absorbed in a war-time amalgamation of such Industries. On the site of the old St. Mary’s Poorhouse and some of its land was built the Dour Iron Foundry for Messrs. A. L. Thomas and Sons, which is now known and owned by the Dover Engineering Works. It was established by Mr. A. L. Thomas about 1855 and there were gradually added workshop after workshop until it extended over a very large area and employed a large workforce. The war period 1914-18 was a particularly busy time both at Charlton Green and at branches close to the docks. Work went on day and night in connection with repairs for the destroyers and drifters of the Dover Patrol which had their base at Dover. Bridge Street is an ancient road which ran across the Black Hors© valley westward up Charlton Bottom to Whinless Down and Hougham, and eastward from the London Road across the river up to Frith Farm and Guston. The part from the Falcon to Charlton Green was probably named Bridge Street after 1828, when the brick bridge spanning the river was first built by the parish, the road previously passing through the stream, with a wooden bridge for pedestrians. Bridge Street, however, is more ancient than 1829. The oldest houses known when this book was written in 1906 were since demolished on the south, side, built with red Barham bricks, between High Street and Branch Street, and another lot flush with the street joining up with Colebran Street. Since demolished those two lots of dwellings were far into the second century of their existence. Those with forecourts along the south side were built about 1835. Bridge Street has had quite its full share of public houses, namely the Black Horse, now the Eagle Hotel, the Admiral Harvey, the Town Arms, and the Wheelwrights’ Arms. The Black Horse was a survival of the name of the old Inn which stood where the Eagle Hotel now is, and was taken down about the year 1839. The Admiral Harvey is a very old public house, although in a new building. The Wheelwright’s Arms a name now associated with The Linces, was the name of a public house opened when Catherine’s Place was built. For over 70 years it was kept by the Gurr family. The houses on the north side of Bridge Street are on the Dover Almshouse Charity laud. Records of that land go back about four centuries. In a terrier of lands taken when Mr. Luke Pepper was Mayor and Master of. the Almshouse Charity, in 1619, Mr John Randall was the tenant of this land, at the annual rent of £5 10s., the name of the place being Paul’s comer. In the year 1812, the same land, consisting of 2 & or 12p., was held by Mir. Shipdem and others at an annual rent of £51 1s. 0d. The land in Bridge Street was sold for building leases in 1828, and soon afterwards houses, part of which were known as Paper Alley, were built at the rear London Road. The land at the comer next the London Road was not sold until 1840, it having up to that, time been used as a stone yard by the Turnpike Trustees who had a turnpike gate between what is now Turnpenny’s, the furnishers, and part of which used to be the Falcon Hotel, and the Eagle Hotel opposite. The Bridge Street houses on the charity land were rebuilt in the early 1900s and named respectively Matthew’s Place, Paul’s Place, and Harveian Place. The corner house east of Granville street, occupied by Mr Brook, grocer, was built when Bartholomew dose was laid out by Mr. Tucker about 1866. The bridge was rebuilt In 1892, and later the road was widened and improved. This also explains the connection between Charlton and the Dover Priory, into the possessions of which, after the Conquest, the manor of Charlton was merged. At that time Charlton was practically without inhabitants, and had no church, but at a later date some one built a little church on the eastern bank of the Dour, which church is known to have existed about the year 1291. The houses then were few in number, and none of them of much importance, there being no resident lord of the manor, the lands being mainly attached to the Priory, the Castle, and the Maison Dieu. The church on the northern boundary of the parish, the mill just below it, and a few scattered dwellings constituted the village of Charlton in medieval times. 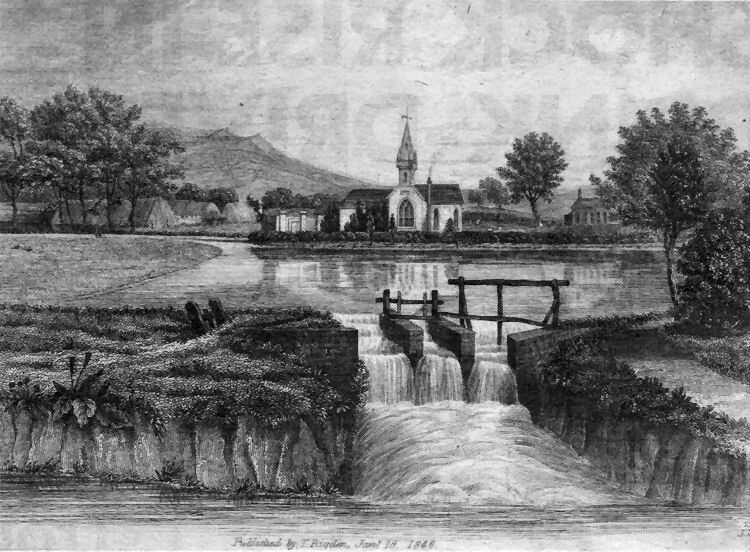 An attractive 1846 engraving of the old church at Charlton, demolished in 1893 when the new church was opened, with the Chariton Mill pond in the foreground and what used to be Barton Farm, on the left. The small chapel-like building on the right could be part of the parochial schools, built about 1840, which stood on the site now occupied by the new church. 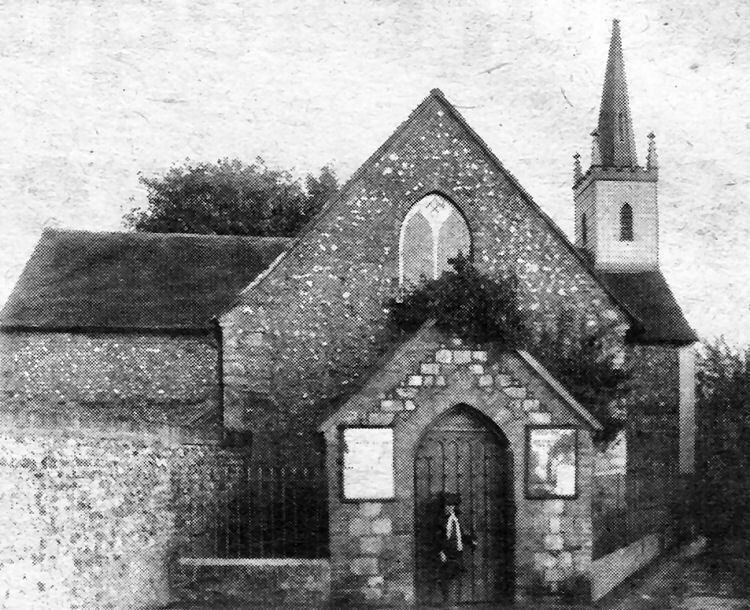 The picture above , showing the church entrance, is believed to date from about 1890.